Look, I've seen a lot of movies in my life. That's kind of my thing. But I completely maintain that out of all the movies I have ever seen, including that period in high school where my then-boyfriend had me watching all these horror movies, nothing has ever freaked me out like the films I saw when I was a kid. Even if those movies weren't actually exactly scary. To adults. 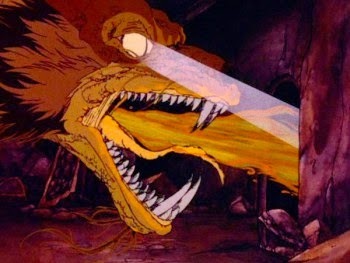 Basically what I'm saying is, is no one else still ridiculously terrified by the animated Hobbit movie? 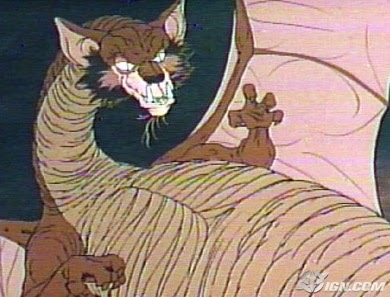 This movie is responsible for half my phobias, a solid third of my neuroses, and a whole heap of childhood nightmares. Why did I watch it, then? Because when I first saw it, at the age of seven or so, it was the only film version of The Hobbit or Lord of the Rings that I had access to, and I will put up with a hell of a lot when I'm obsessed with something. Apparently. No, but seriously. This movie terrorized me as a child, but I watched it faithfully over and over again. And it's not like it got less scary with time. I think, instead, what happened is that I started to kind of like being scared. And that is worth talking about. 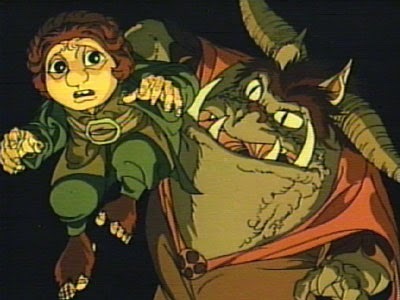 So for those of you, that blessed generation, who don't really remember life before the Peter Jackson Tolkien adaptations were a thing, and for those of you who managed to somehow miss this monster of a film anyway, the animated Hobbit is a 1977 made for TV movie. Running at a scant 90 minutes, it is literally one sixth of the length of Jackson's adaptation. 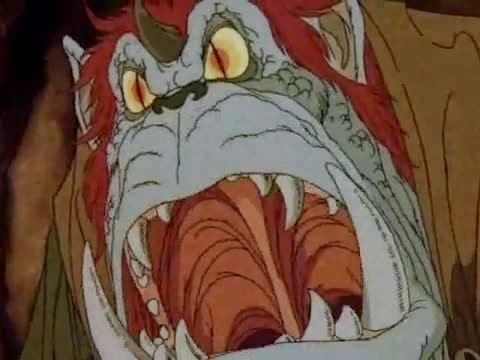 And for those of you who know your animation history, it was made by Bass and Rankin, who also made The Last Unicorn and Thundercats. The story is basically a quick rundown of the book. 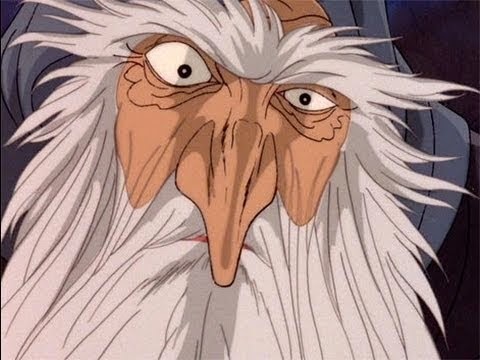 Bilbo Baggins (voiced by Orson Bean) is a hobbit with a potbelly who doesn't want to go anywhere or do anything interesting. 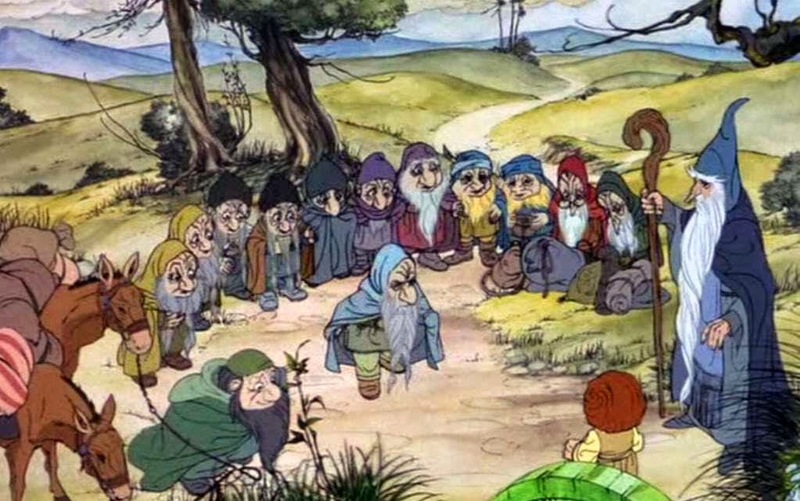 But when the Gandalf (John Huston) and the dwarves show up, he's lured by talk of treasure into joining them on a quest to save the Lonely Mountain from the evil dragon Smaug (Richard Boone). 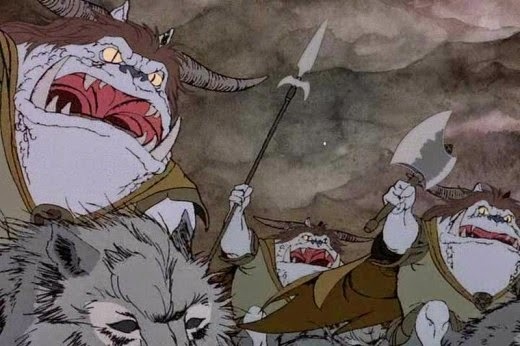 And of course along the way they run into some nasty trolls, a mountain full of goblins with a surprisingly catchy theme song, Gollum and the Ring, and other stuff like that. I will say, actually, that I think this version, for all that it's super weird (and we'll get to that in a minute) is probably more accurate to the book than Jackson's version. I'm not saying it's better, because it isn't, but it does keep more to the feel of this being a quickie adventure story for children. Horribly traumatized and frightened children. Just because the story is very in tune with the book doesn't mean that it's not still really weird. That's the thing. Somehow, this adaptation managed to keep the spirit of Tolkien's writing while making a lot of incredibly sketchy choices in translation. 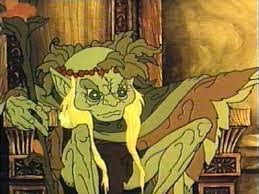 The Mirkwood elves, for example, are portrayed not as extremely attractive human beings like they are in the books, but as spindly, green, almost plant-like Germans. No, really, Germans. They all have German accents and perpetual scowls and Thranduil is voiced by Otto Preminger. Which is interesting because earlier in the film we meet Elrond, who is just a super attractive person type thing (voiced by Cyril Ritchard), and we don't even realize they're the same species. So that's weird. The goblins are a bit different than I remember Tolkien describing them, but that's less of a thing, because Tolkien isn't super clear on the bad guys. He tends to leave a lot to the imagination. 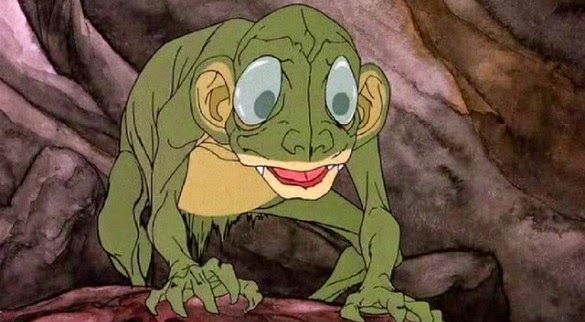 Hence, Gollum in this adaptation very well might be what he was thinking of. In this version, I feel the need to point out, Gollum isn't a thing much like a Hobbit, he's a sort of amphibious blind salamander fish dude. It's a really fascinating character design, but, again, terrifying. I don't even want to go into detail on why the spiders freaked me out, but suffice to say that the spiders of Mirkwood are responsible for the last nineteen years of my shrieking and screaming when I see a large arachnid. But more than just the production design choices in this film, there seems to be an underlying tone to the movie, one that is much more serious and deep than any other version I know of. Here, this is the first scene of the movie, and I want you to pay attention to how dark it feels. I mean, nothing bad has happened yet, but this whole sequence is so ominous. It's terrifying, right?! And this is the most innocuous part of the story. But, like I was saying above, I think that there came a point in my watching this movie where all of this fear, the terrifying elves and spiders and Gollum, became the reason why I watch this movie. And more than that, it became why this movie for me rings true. It's the tone. Yes, this movie still freaks me out, but there's something I love in how seriously it takes the story. There's no ironic detachment here. Bilbo's story is epic. It's full of danger and darkness, and the movie doesn't gloss over that. It doesn't try to make it okay. Instead, it sort of reaches out a hand and pulls you along, whether you're ready or not. I think there's a value in that. There's value in recognizing that sometimes we, like Bilbo, really don't want to be pulled from our comfort zones but we desperately need to be. And there's value in seeing that the road very well might be scary. It might be ominous and fearful and full of terrors. But we have to go anyways. 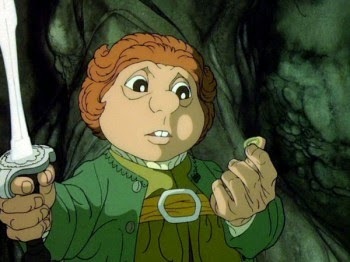 In a big way, I think that this Hobbit had a far greater impact on me as a person than any of the Peter Jackson films. I mean, those are great, don't get me wrong. And I love them deeply and tenderly (though I love Lord of the Rings much more than his Hobbit adaptations). But those are films I saw as a teenager and an adult. This movie I saw as a child, and it shaped me. It inspired me to seek out things and people who scare me a little, because that's how the best stories are told. And, yes, it absolutely gave me arachnophobia and it totally has some really silly dumb moments - like when Smaug can shoot lasers out of his eyes or the whole troll sequence - but that doesn't detract from the movie as a whole. It's not a great film, but it was a formative one, at least for me. Fear should not stop you from doing something important, and knowing enough to be afraid is sometimes a really good life skill. I think I kept watching this movie so much because it freaked me out. But more than that, because it offered me something at the end of my fear: a chance to do great things if I can just make it past my own doorstep. And now, a collection of real screencaps from this movie just so I can point out that I am really not kidding, it is absolutely terrifying and will give you nightmares. You're welcome. I don't think I've ever seen this one. 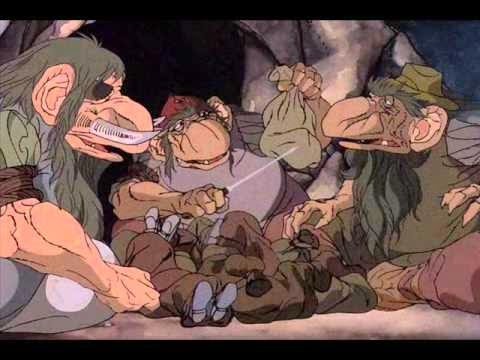 I remember watching the Bakshi-version of the Lord of the Rings, though. (On imdb: http://www.imdb.com/title/tt0077869/ or wikipedia: http://en.wikipedia.org/wiki/The_Lord_of_the_Rings_%281978_film%29 ) That was... weird. Announcing the Winners of the 2014 Undies! Last Chance to Help Pick the 2014 Undies!